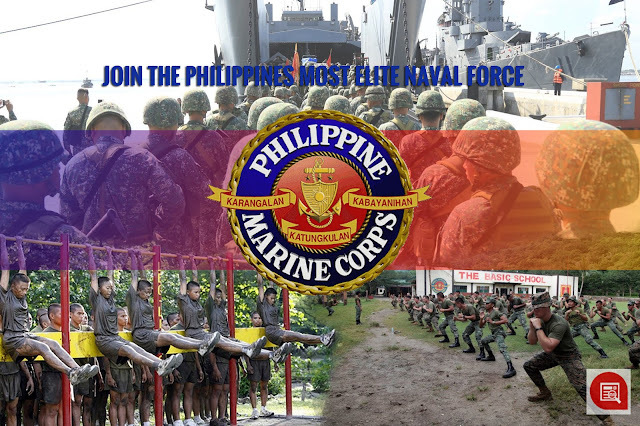 Philippine Marine Corps conducts Recruitment in Koronadal City #PMC #PN - Exam News, Reviewer, Military Career, & Everything [MN] . .
October 14, Manila (PN) - The Philippine Marine Corps (PMC) Mobile Recruiting Team (MRT) will conduct recruitment of Candidate Soldiers in Koronadal City, South Cotabato (Region XII). Must be a Filipino Citizen and of Good Moral character. Must be 18-23 years old. Unmarried and with no child to support. Must not have any pending civil / criminal case. Physically, Mentally and Psychiological fit for military training. Insurance and Health Care Benefits. Leadership and other Skills Training. Free Medical and Dental Service (Including Dependents). Opportunities for Post Graduate studies both within the country and abroad. Opportunity to lead the sailors / marines. Opportunities to serve in international peacekeeping missions under United Nations. Basic pay of Php 16,215.00. Additional monthly allowance of Php 5,750 pay. Longevity pay 10% of the current monthly base pay compounded every five years of active military service.